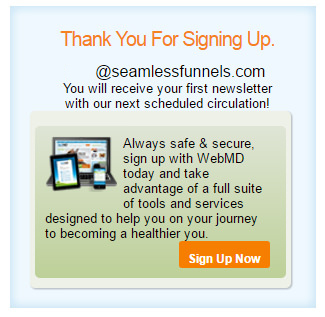 You’re about to step into WebMD’s marketing funnel, which along with its web properties have earned authority through the years to become one of the most trusted health web brands. Listed as the second most important health website by Alexa, but stands as the number one performer in organic health search with more than 80 million organic visitors per month according to SEMRush. Let’s dive right into it, and discover a few strategies to improve your marketing funnel. 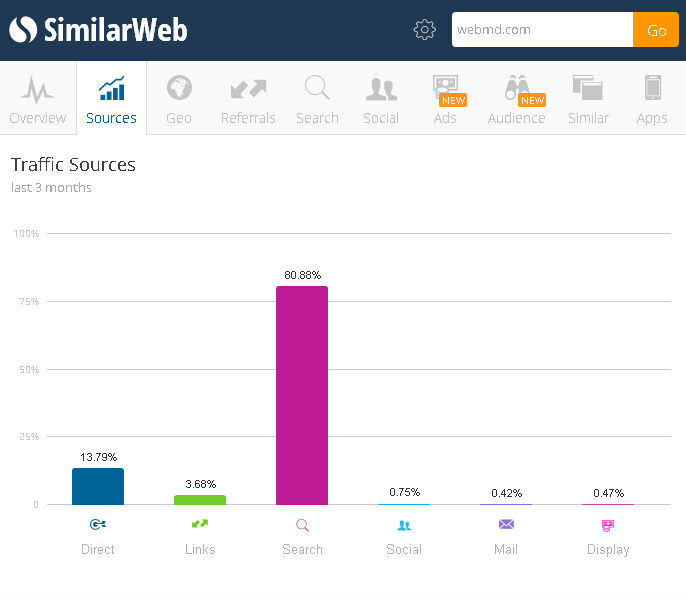 According to SimilarWeb, WebMD’s traffic mainly comes from organic sources. Browsers begin their journey into the marketing funnel by searching online for informational health queries like symptoms, causes, prevention, diagnosis, treatments and other topics related to a certain condition. 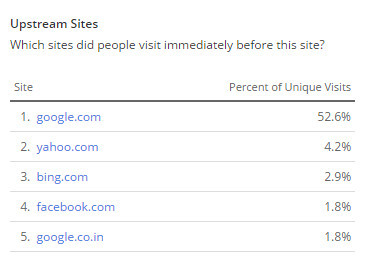 Traffic source breakdown: 80.03% of traffic coming from search engines. Alexa reports that 52% of WebMD’s organic traffic comes from Google. Although most of the times you will only see marketing funnels analyzed from one perspective, seeing it from multiple angles can help. Since WebMD’s marketing funnel ultimately lead to a advertisement. Advertisers should carefully analyze WebMD’s marketing funnel as it’s own funnel, separating the visitor’s needs from what the marketer want to expose new insights from this marketing funnel. Let’s analyze the stages of the funnel viewed from the consumer’s perspective. In this stage of the funnel a person will experience a trigger and become aware of the need. It’s important to note that depending on the urgency of the need, which will vary according to how serious the condition and stage, consumers will go from the awareness stage of the funnel to the consideration or usage stages. At the discovery stage of the funnel a person will start searching for information online. Browsers become visitors of a website and move into the middle of the funnel where the evaluation stage take place. At the evaluation stage of the funnel visitors are going through the content trying to find answers. If the visitors are continually interested in the topic at this point they subscribe to the newsletter to receive more information about the topic or to get some type of benefit. At the consideration stage visitors are determining the best options available. Either they need more information and will consider step back into the evaluation stage and researching other websites, asking for advice or seeing a doctor. Visitors become costumers and use some type of treatment, medicine or product. At the advocacy stage of the funnel consumers will either recommend and share good reviews or criticize and share bad reviews online. If consumers are satisfied with the end result they will move into the re-usage or re-purchase stage of the funnel. At last, in the loyalty stage consumers will re-purchase through the years when the need arrives depending on the type of disease and condition. Stages of the funnel viewed from the marketer’s prospective. In this stage of the funnel content organically ranked in search engines bring visitors to specific topic pages. This is where content provides value by answering the visitor’s questions and start building trust to take visitors to the lead acquisition stage. At this stage of the funnel visitors are offered to become subscribers with the incentive to get more content on a specific health topic on a weekly or daily basis. Lastly visitors become subscribers or readers where they get exposed to more content and advertising over and over again. At this stage of the funnel they may also start following profiles on social media and participating in one of the WebMD’s communities. At this stage visitors will click on ads throughout the journey or in the newsletter. The strategy behind this content marketing funnel is to bring as many organic visitors as possible, creating awareness of the brand, building trust by publishing high-quality content, and converting them into subscribers to repeatedly advertise to them through email marketing. With a very rich content marketing calendar, WebMD publishes content in general health, conditions, food, nutrition, beauty, fitness, exercise, pet, family and parenting categories. Let’s just use “pneumonia” as an example, which is according to alexa a query that leads 0.38% of its massive traffic to WebMD. Google keyword planner shows around 550,000 searches for “pneumonia” per month. WebMD ranks number one for the query with the pneumonia topic overview page which provides an overview of the topic plus links to other pages with further reading including symptoms, causes, prevention, medications, treatments, health-tools and other related information about pneumonia. As we land on the topic overview page. Why should I trust WebMD? At this stage of the funnel, is the content matching the searcher’s intent and expectations? This may depend on the specific condition. 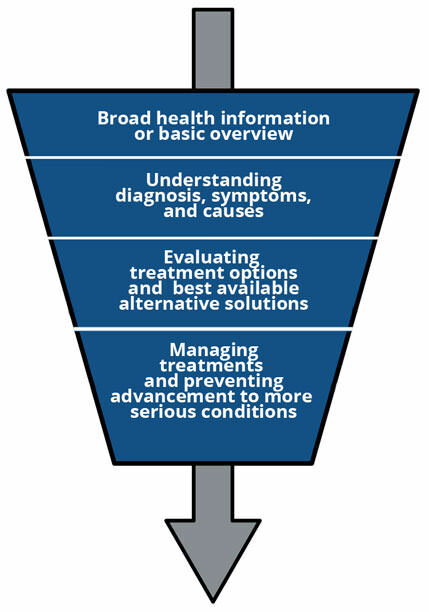 From the awareness stage of the funnel to consideration and decision, the pneumonia topic overview page has a vast range of links to cover every subtopic, so certainly this information would be very useful and match the searcher’s intent wherever they may be in the funnel. Why should I trust the content? Trusting the content is key! That rule applies to all websites, but when it comes to your health or of a loved one, it becomes critical! Tactically placing evidentials that answer visitor’s concerns in the though sequence will reduce friction and keep them moving forward. In this case WebMD did provide reference at the end to the Physician who reviewed the article. It’s important to note that the evaluation will become more rigorous depending on the condition and stage of the disease. Placing credentials with as much information as possible is highly recommended. WebMD has a very basic lead acquisition strategy. A simple popup is displayed as you scroll down offering visitors to get daily health tips and wellness updates. The second lead acquisition is below the fold at the bottom right and it allows you to select topics of interest. Lack of benefits reducing the value perceived by the reader. 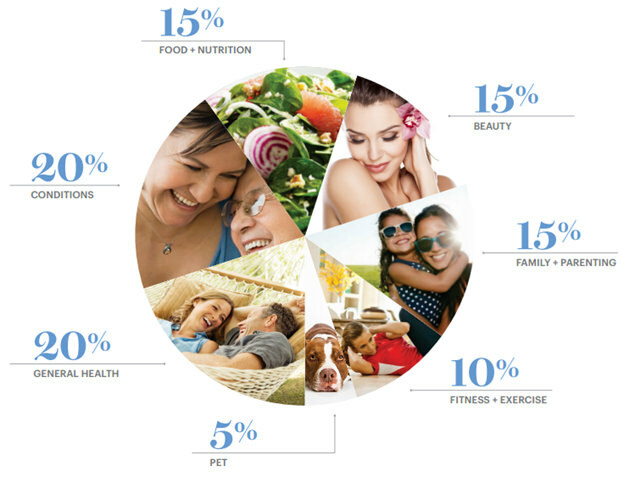 By offering select topics WebMD increases the reader’s interest but also reveals that the list is segmented by topic. 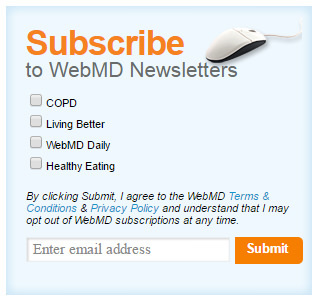 Let’s just say I am interested in getting more information, so I select COPD and hit subscribe. Now I’m presented with the thank you popup with an offer. It’s great to know that you will be getting the newsletter with the next scheduled circulation but it’s not specific enough, which then makes the reader guess the exact schedule and therefore take a bigger chance in losing interest. They offer the option to sign up to take advantage of tools and services, but they failed to provide benefits or advantages of using them. There is no value perceived by the call to action. WebMD emailed from July 2015 to May 2016 twenty to sixty articles. How many times a month they email content? Here’s the average amount of articles published and/or emailed to WebMD’s Lists. How long is the copy? The topic overview page WebMD has 2098 words. But most articles are between 1000 to 2500 words. How big is the WebMD’s website? By using the site operator we can see the magnitude of WebMD’s organic marketing funnel. I actually had to count it twice to make sure it was right. Above 10 million results. Yes that’s right! How old is the WebMD website? Why is it important to understand the content structure? Google’s AI (artificial intelligence) technology called “rank brain” learns on it’s own, which means it must utilize the current knowledge or the index to make comparisons with trusted websites, which means if the most trusted websites have content structured a certain way and talk about certain topics and link to certain websites you should carefully research the topics and how they are linked, and most importantly understand the semantic relationships between topics in a niche. To discover gaps in your content and semantically analyze relationships of topics in your website I recommend using MarketMuse.com. Produce high quality content that answer the visitor’s thought sequence and include evidentials to validate your content and reduce friction. Check Google analytics and improve pages that have high bounce rate. Consider creating topic overview pages. Focus on the value perceived in exchange for the click. If the value perceived is much greater than acquiring emails will be easy. Communicate as often as possible with your list and always provide as much value as possible so you can build an authoritative and lasting relationship. According to Moz’s Open Site Explorer it’s domain authority is 95/100, which compares to other top health websites currently ranking for the most searched health queries. Starting at the broadest term online “health”, we narrowed down to the categories to find out what are the most trusted health websites. How are YOU using funnels in your business? Which of these marketing funnel strategies are you going to take action on next? Have you tested or implemented these funnel strategies and gotten better results? It would mean the world to me if you share your results and stories in the comments below…I can’t wait to hear from you! Copyright text 2017 by Seamless Funnels.